The damage to China’s economy from the trade war with the U.S. can’t be immediately made good even in the case of a resolution with President Donald Trump, Citigroup economists say. 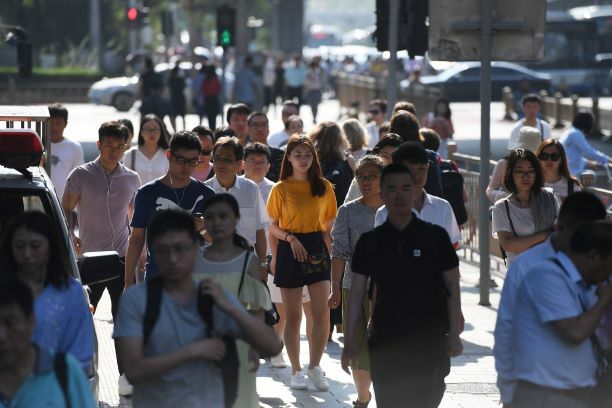 That’s because the tariff war is underlining China’s rising cost of labor at a time when the job market is under pressure, Citi economists led by Liu Li-Gang said in their 2019 economic outlook report. The trade war with the U.S. could cut China’s export growth by almost half next year, putting around 4.4 million jobs at risk, the economists wrote. “It is a reality that China is losing some of its cost competitiveness, especially in labor-intensive and low-value-added sectors,” according to the report. “Although shifting the supply chains is not feasible in real time, manufacturers may seriously weigh the option of leaving China if punitive tariffs last longer than expected." Even amid signs of a detente between Beijing and Washington, Citi’s baseline scenario is still that the 15 percent additional tariff will be levied on Chinese exports after March 1, as 90 days may be insufficient to resolve "large differences" between the two countries on issues of IP protection, forced technology transfer, state support to state-owned enterprises, and cyber intrusion and theft. The economists expect the trade war will cut China’s export growth by almost half to 5.1 percent in 2019. The 25 percent tariffs on US $250 billion worth of imports from China would reduce China’s exports by 5.6 percentage points, denting GDP growth by 1.04 percentage points. That is because more than half of China’s exports to the U.S., equivalent to around $127.1 billion worth of goods, could be replaced by goods from other countries, which translates to an equivalent reduction in China exports to the U.S., Liu explained at the briefing in Hong Kong. There are worrying signs already visible in leading indicators of the job market, such as a worsened PMI-employment index, increased unemployment benefit claimants, and a decline in urban household confidence in current and future employment sentiment, Liu said. Yet looking ahead, Liu thinks the trade war will help accelerate the growth and opening-up of the Chinese economy and capital markets in the long run despite the short-term pain, citing that a land leasing title reform in rural parts of the country has become more urgent given the trade war. "We believe this reform could be the most effective policy response to mitigate the trade war shock to the Chinese economy, as it could potentially bring about $20.6 trillion wealth effect to rural families," according to the economists. Liu suggested that the boost in rural consumption, particularly in auto purchases, could be more than sufficient neutralizing the lost exports to the U.S.